When I think about my favorite holidays, I can’t help but think about the menu with a beautifully glazed ham. A glazed ham is a feature of many feasts and special occasions. 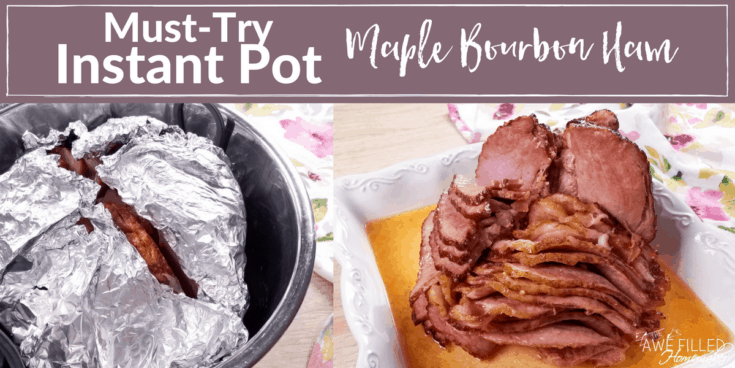 One way to give your store-bought ham a homemade twist is to sauce it up with maple syrup and bourbon whiskey. Christmas, Easter, Mother’s Day, Brunches, the 4th of July, and any occasion where we all gathered as a family, ham was guaranteed to be on the table. 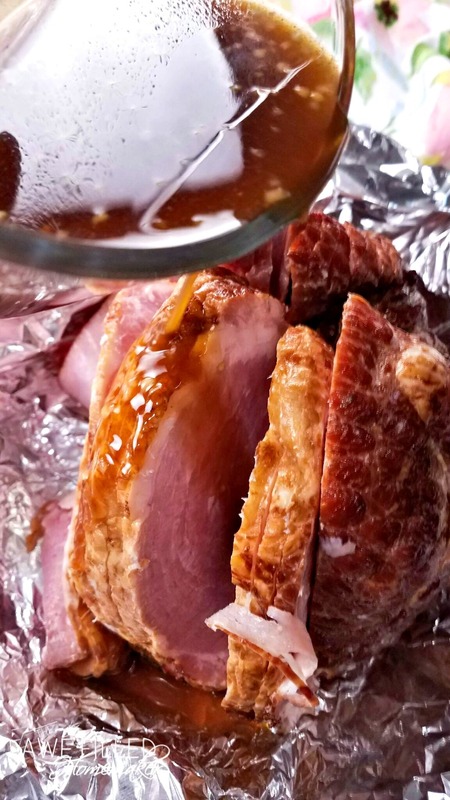 Now this recipe isn’t exactly the same recipe that I ate as a kid, but I have taken the heart of the celebration- the ham- and created this recipe that is a huge hit in my family and extended family. 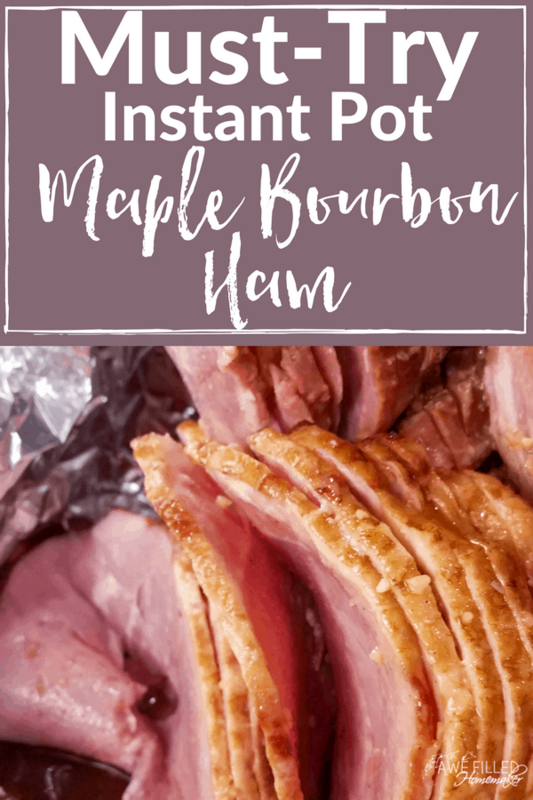 This recipe can easily be made in the oven but I wanted a ham recipe for my Instant Pot since, ya know, I have 4 of them and cook with them ALL the time! LOL! 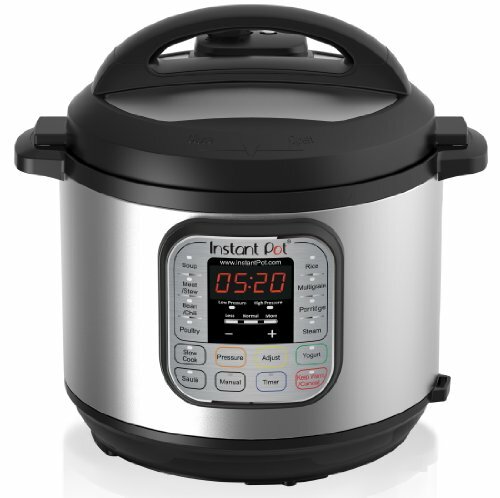 Actually, I use my Instant Pots more than my oven. 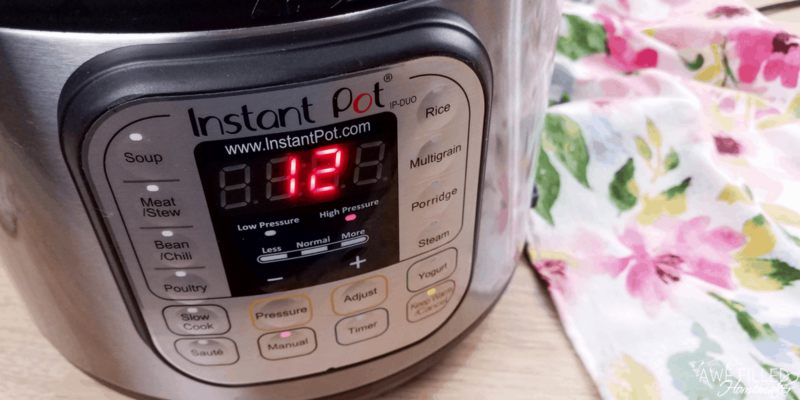 My Air Fryer and my Instant Pots keep my kitchen going. Anyway, I wanted a delicious ham recipe that I could toss in the Instant Pot and let it cook while I was working on other dishes for our own family get togethers. 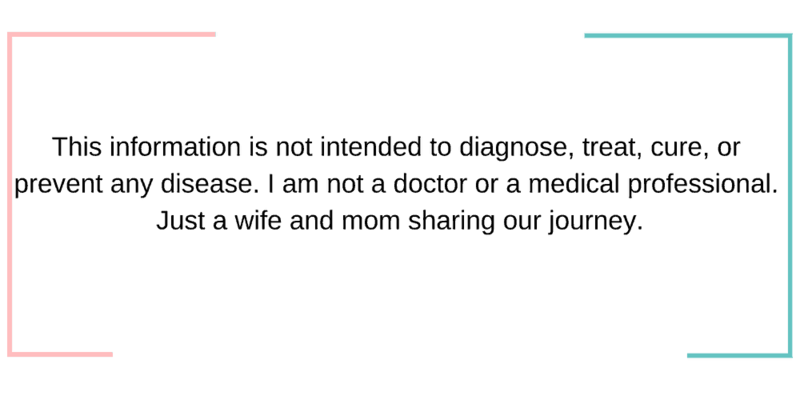 It makes my life as a busy mom, wife, and business owner SO much easier! Before I get to the recipe I must give this disclosure: I know that cooking with alcohol of any kind can be controversial. However, just like with beer battered onion rings, fruit cakes, and other tasty foods that contain alcohol, it does cook out. If this isn’t your cup of tea, per se, I totally understand. You can sub apple juice or something else if you prefer. 1) In a small bowl, whisk together the mustard, bourbon, maple syrup, garlic, paprika, and apple cider vinegar. When the syrup and mustard is dissolved, mix in the brown sugar and stir until dissolved. 2) Make a large foil pack for your ham. Place the ham in the center of the foil then pour the glaze over the ham. Close the foil packet. 3) Add 2 cups water to the Instant Pot insert and place the trivet on the bottom. Place the foil packet of ham on the trivet. I used a trivet with long handles, but if you do not have this trivet you will want to make a foil sling to help you lower and remove the ham. 4) Close the lid and turn the pressure valve to sealing. Cook the ham on high pressure using manual for 12 minutes. Let the pressure release naturally. 5) Remove the ham using the trivet or foil sling. Open the foil packet and spoon the juice over the ham. Let the ham cook for about 5 minutes more on manual. Don’t Forget To Print Out The Recipe Out For Later! 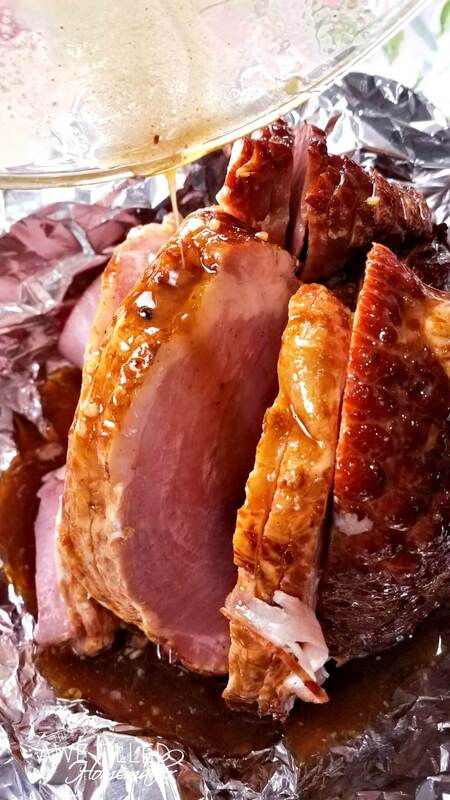 A glazed ham is a feature of many feasts and special occasions. In a small bowl, whisk together the mustard, bourbon, maple syrup, garlic, paprika, and apple cider vinegar. When the syrup and mustard is dissolved, mix in the brown sugar and stir until dissolved. 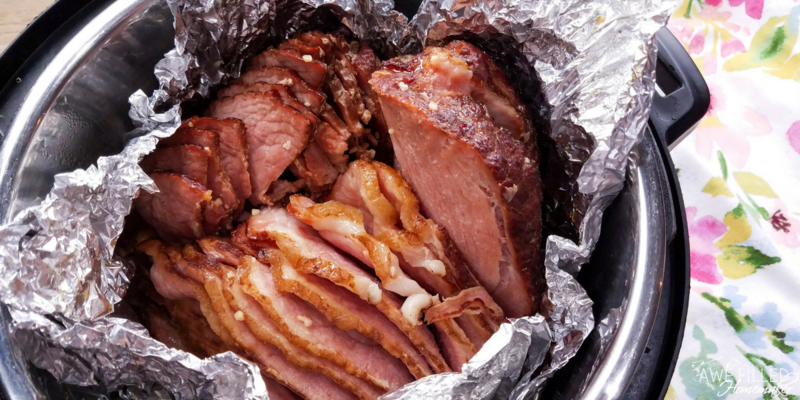 Make a large foil pack for your ham. Place the ham in the center of the foil then pour the glaze over the ham. Close the foil packet. Add 2 cups water to the Instant Pot insert and place the trivet on the bottom. Place the foil packet of ham on the trivet. 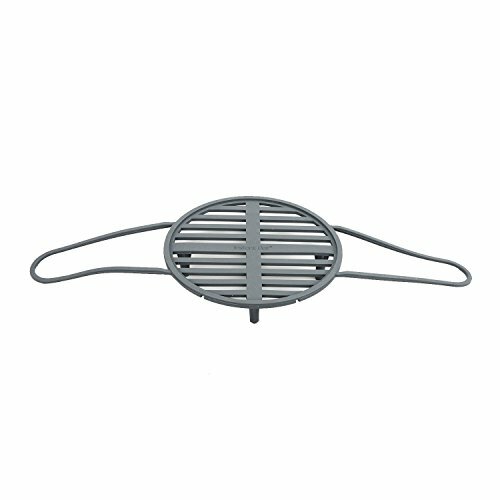 I used a trivet with long handles, but if you do not have this trivet you will want to make a foil sling to help you lower and remove the ham. Close the lid and turn the pressure valve to sealing. Cook the ham on high pressure using manual for 12 minutes. Let the pressure release naturally. Remove the ham using the trivet or foil sling. Open the foil packet and spoon the juice over the ham. Let the ham cook for about 5 minutes more on manual.